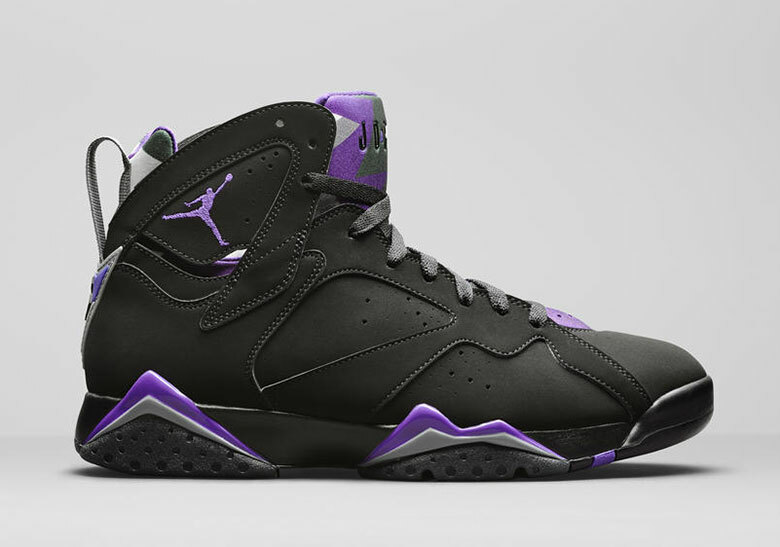 Among the many sneakers releasing as part of Jordan Brand's 209 Summer lineup is an all-new "Ray Allen" Air Jordan 7, which serves as a nod to Ray's days with the Milwaukee Bucks. The special edition sneakers first surfaced a few weeks back, but Jordan Brand has recently provided an official look at what to expect when the Ray Allen 7s launch in June. The sneakers sport a black upper accompanied by hits of purple, grey and green, reminiscent of the classic Milwaukee Bucks uniforms from the late '90s. "Hall of Famer Ray Allen has one of the most storied Jordan PE collections in history. To celebrate the 23rd anniversary of his draft, a special colorway of the Air Jordan VII that brings together two of Allen’s PEs from his time in Milwaukee will release June 1." Ray Allen's original "Milwaukee Bucks Away" Air Jordan 7 PE, featured a black leather upper, along with purple and grey detailing, and his #34 stitched on the upper ankle. This upcoming Air Jordan 7 differs slightly in that it appears to be constructed of nubuck, and is grounded by a green-tinted outsole. The sneakers are officially slated to drop on June 1 with $190 price tag. Check out some additional photos in the IG post embedded below.